UDAY GUJARAT - DGVCL DASHBOARD: Depicts Pre and Post UDAY current cumulative Progress of DISCOM in key Operational and financial Parameters of UDAY. POST UDAY GUJARAT - DGVCL IMPROVEMENT TREND: Depicts the cumulative/quarterly progress, in absolute terms, made by the Discom during post UDAY period ( shown through green bars in the graph). The pre-UDAY position as on 31.03.2016 is shown through blue bar in the graphs. UDAY GUJARAT - DGVCL IMPROVEMENT BAROMETER: Depicts improvements made by DISCOM Post joining of UDAY in line with Targets/Projections as per MoU. It is graded Quarterly on the basis of 14 financial/ operational parameters of UDAY. It signifies the performance of the DISCOM as on date on major financial/Operational UDAY Parameters. 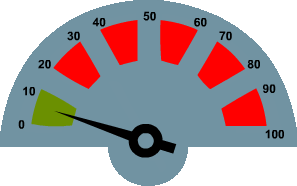 The Dashboard represents the cumulative progress (i.e. Pre and Post signing of MoU under UDAY) made by the DISCOM on these parameters. Note:1. Mouse over on each of the barometers above to see specific progress details. 2.Progress shown above is as per provisional data provided/ entered by respective State Utilities. Depicts the cumulative/quarterly progress, in absolute terms, achieved by the Discom during post UDAY period ( shown through green bars in the graph). The pre-UDAY position as on 31.03.2016 is shown through blue bar in the graphs. It signifies the post UDAY cumulative progress made by DISCOM on targets set against selected 14 UDAY parameters. For first twelve parameters, the performance of DISCOM is evaluated by comparing the achievement with respect to the targets submitted or MoU projections. Calculation for assigning the marks against improvement shall be done on quarterly basis based on data entered/provided by the DISCOM.